The country faces political instability after voters angry at crippling income cuts punished mainstream politicians by withdrawing support – but gave no one party enough votes to govern alone. BAILOUT RELIANT GREECE faces days, possibly weeks, of political instability after voters angry at crippling income cuts punished mainstream politicians and let a far-right extremist group into Parliament – but gave no party enough votes to govern alone. With more than 99 per cent of the vote counted Monday, conservative New Democracy led with 18.9 per cent and 108 of Parliament’s 300 seats. Party leader Antonis Samaras, who backs Greece’s bailout commitments for austerity, will launch coalition-forming talks later in the day. “I understand the rage of the people, but our party will not leave Greece ungoverned,” Samaras said after Sunday’s vote. After receiving the mandate from President Karolos Papoulias, Samaras will have three days to strike a coalition deal. But that could prove impossible because even with the support of the only other clearly pro-bailout party elected, Socialist PASOK, New Democracy would fall two seats short of a governing majority and would have to win over adversaries. Sunday’s big winner was the anti-bailout Radical Left Coalition, or Syriza, whose unprecedented second place with 16.76 per cent gives it 52 seats. Disaffected voters deserted PASOK and New Democracy, the two mainstays of Greek politics, leaving them at their worst level since 1974, when Greece emerged from a seven-year dictatorship. Instead, strong gains were registered by smaller parties on both the left and right, including the extremist Golden Dawn, which rejects the neo-Nazi label and insists it is nationalist and patriotic. The movement has been blamed for violent attacks on immigrants and ran on an anti-immigrant platform, vowing to “clean up” Greece and calling for land mines to be planted along the country’s borders. The party won about 7 per cent of the vote — a stunning improvement from 0.29 per cent in 2009 — and won 21 seats. Sunday’s outcome showed widespread public anger at the harsh austerity measures imposed over the past two years in return for rescue loans from other European Union countries and the International Monetary Fund that are keeping Greece solvent. Without the funds, Greece faced a disastrous default that could have dragged down other financially troubled European countries and seen it leave the euro. PASOK, which has spent 21 years in government since 1981 and stormed to victory with more than 43 per cent in 2009, saw its support slashed to 13.2 per cent. It will have just 41 seats, compared to 160 in the last election. Sunday’s turnout stood at 65 per cent — a low figure for the country, where voting is officially compulsory, although no sanctions are applied for not casting a ballot. A total of seven parties won representation. If Samaras fails to strike a coalition agreement, the mandate will go to the second party for a further three days, and then to the third party. If no deal can be reached, the country will hold new elections in about a month. Riding high on his massive gains, Syriza leader Alexis Tsipras stuck to his anti-bailout position, saying the agreement should be overturned altogether. Email “Greek election impasse heralds lengthy instability ”. 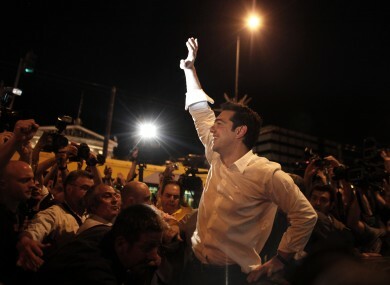 Feedback on “Greek election impasse heralds lengthy instability ”.